1. (4) will be in the ballside short corner and (5) will be on the ballside elbow whenever the ball is on the wing. 2. (5) will �point� the ball whenever it is on the wing or the point. This rule will apply at all times except the very beginning of the play. 3. Anytime the ball crosses the center line of the court, the point and the attack side wing player will exchange. The attack side player will look to attack the back of the zone prior to moving to the point. The center line is a line perpendicular to the baseline that passes through the basket. 4. On any skip pass from the short corner, (4) will follow the pass to the free throw line and (5) will attempt to seal his man on the low post. A skip pass from the short corner will be to the point or the attack side wing. 5. During a sequential reversal, (5) will downscreen for (4). 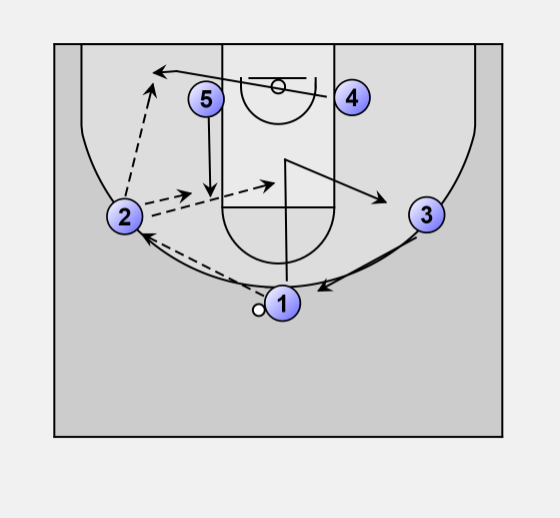 (4) will �v-cut� through the lane and then to the opposite short corner. (5) will follow (4)�s cut and move to the ballside elbow. A sequential reversal is a wing to point to wing passing movement. wing or from elbow to wing. 7. When the ball moves to the short corner, (5) will cut to the basket and then the attack side low post. 8. The four players without the ball need to be aware of the player with the ball penetrating to the basket.